This is one of the most delicious breads I have baked so far. An Apple Yeast Bread is BY FAR the best bread in the world. Homemade and with fresh apples brings it to another level. O EM GEEE!! Most apple bread recipes are made with simply baking powder and the consistency is, um, no, just NO! It’s not like bread!! It’s like banana bread but not as good. Banana bread can be a dessert and “caky” (is that a word). Apple bread should be a “real” bread though in my opinion. A yeast bread! 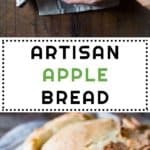 So how does one go about making an apple yeast bread when apples brown and ferment super fast and yeast breads require several hours of rising? Breads made with starters are beyond delicious and so much superior to any other form of bread! The consistency of a bread made with starter is completely different. Make a starter. Just do it! Mix the necessary ingredients and leave at room temperature for at least 12 hours. Let the yeast do it’s magic. After 12 hours of leaving the flour and proofed yeast in a bowl covered with a kitchen towel at room temperature it should look like this (if it doesn’t you didn’t proof your yeast, naughty you!). Artisan yeast apple bread requires several rises. 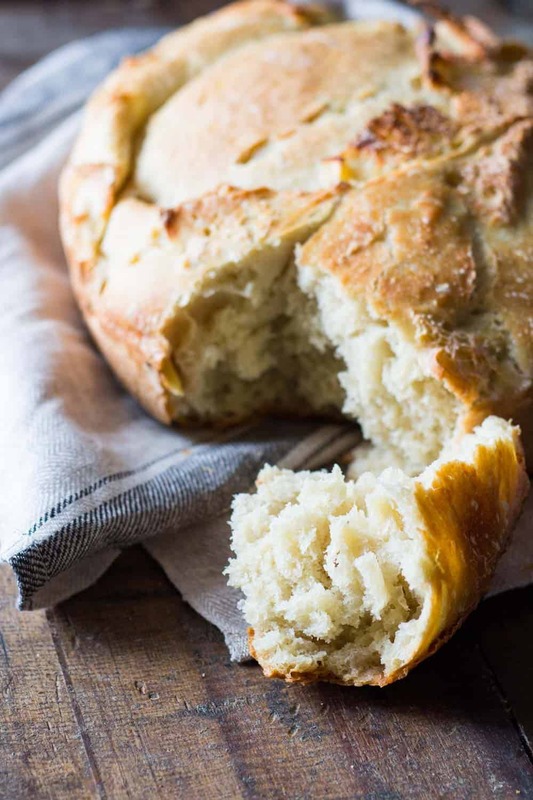 This specific bread calls for a 12-hour rise of the starter and then two 45-minute rises. Remember, you don’t have to do anything at all while the bread is rising. Making bread is a long process BUT only requires a couple minutes of actual work in between rising/resting time. In total you put in maybe 10 minutes of active work here. Use a stand mixer to knead the starter and rest of ingredients with dough hook attached for a good 20 minutes on low. This is so the gluten is activated. You can’t do this by hand. The dough is too sticky and also, you’d need a bodybuilder’s muscle to make it through 20 minutes of kneading. If you don’t have a stand mixer ask around and borrow one from a friend. 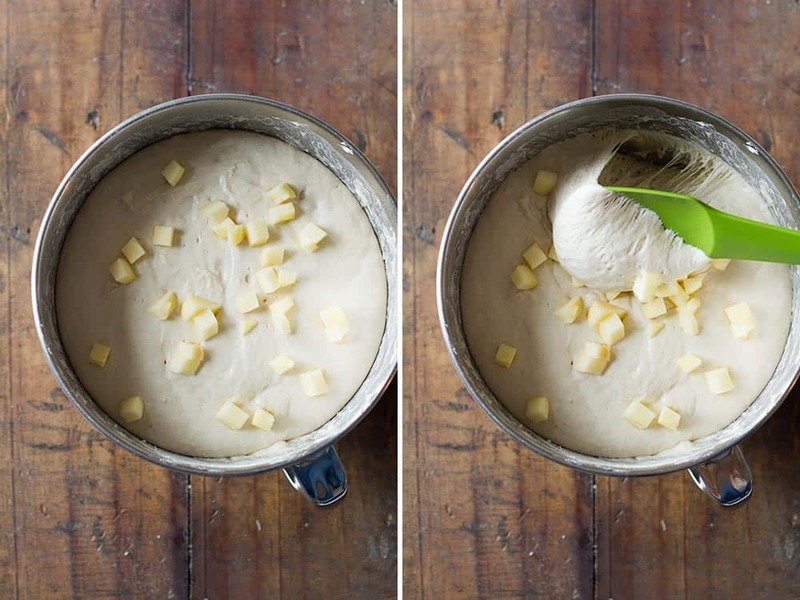 The dough should end up very sticky and elastic (left photo). Cover it with a clean kitchen towel and let rise at room temperature for 45 minutes or until the dough has doubled in size (right photo). After the first rise it’s time to fold in the fresh apples. I recommend adding the apples this late in the process to avoid fermentation. If you add the apples in earlier it will ferment and make the dough pretty sour. I wonder also, if the dough would even rise the first time due to the weight of the apples. It’s best to let the dough rise first, then add apples, then rise again. You can leave the dough in the same bowl for the second rise but I prefer dumping it into another parchment paper lined bowl for easier and risk-free transfer into the burning hot dutch oven later. It’s so much easier to lift the dough out with the parchment paper and then turn around and dump in the dutch oven. I guess you could even dump it in just like that with the parchment paper at the bottom. I prefer to remove. Just in case. So it doesn’t stick? Anyway. I dump it into a parchment paper lined bowl, cover with the kitchen towel again and let it rise a second time for about 45 minutes. 15 minutes into the second rise I turn on the oven with the dutch oven inside for it to heat up properly. EDIT: After several attempts with the second bowl with parchment paper method I was always kind of bothered that quite a bit of the dough stays stuck to the parchment paper. I tried oiling it, too but nah, not a good idea. Then I tried a different method. The dishtowel covered in flour and corn meal method and it works PERFECTLY!! No dough at all stays stuck to the dish towel. Shake it out in the kitchen sink, through it in the wash that’s it. There are two reasons apple yeast bread or any yeast bread really will form a dome. One, the bread dough is given enough opportunities to rise. Two, the bread dough is baked in strong heat coming from all directions. Most of us have regular ovens. Heat from the top and heat from the bottom. That’s it. Regular home ovens do not emit heat from all around. Bakeries have special ovens. Many of their ovens are stone ovens where the stone retains all the heat and radiates it back to the whole surface of the bread. The only way to “imitate” this is by using a dutch oven. I’ve tried with a oven-proof stainless steel pot with oven-proof glass lid and … it doesn’t work. Stainless steel doesn’t “store” heat. 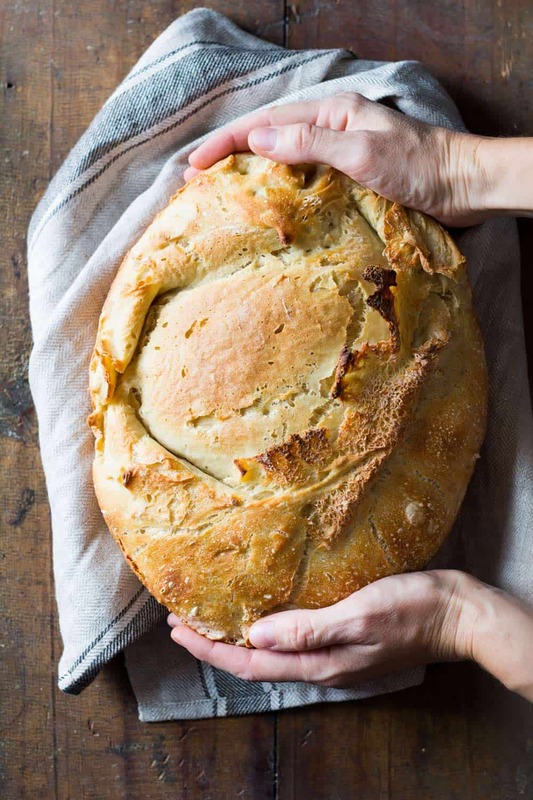 It becomes hot, yes, but as soon as you take it out of the oven to dump in the bread dough, it immediately starts cooling down. A cast-iron pot keeps the heat for muuuuch longer. Enough time for you to dump in the dough, put the lid back on and transfer back in the oven without it cooling down even 1 degree. Now, if you don’t have a dutch oven, don’t go run and buy one. They are quite pricey. Ask around if someone can borrow you theirs (<- that’s what I did by the way. Thank you Sophie! :) OR if nobody can borrow you one just use your cast iron pan (I’ve done that before with this No-Knead Bread). If you don’t have either, use a baking sheet. Your bread will not produce a beautiful dome. It will for sure still taste absolutely amazing though. One important tip: be really, really, really, really, really, really careful when taking the dutch oven out of the oven. It will be BURNING HOT! Use very thick silicone oven gloves or double up your regular cloth gloves. The burns you get from a hot dutch oven are unbelievably painful. All concentration is required here. Don’t multitask at this point. Do only ONE thing. Keep your eyes only on the oven and your body parts. Place the freshly baked bread on a cooling rack and wait for it to COMPLETELY cool down before cutting into it. If you cut into hot bread all the steam escapes and the center stays “doughy”. The bread needs to cool down slowly for the steam to do it’s work on the inside of the apple yeast bread. It’s time to finally, finally break apart a piece of this masterpiece of a healthy apple bread. Don’t use a knife. Use your hands. Eat an uneven piece. It tastes so much better that way. Eat your first piece just like that. You can eat the second with butter or dunked into butternut squash soup. Eat the first piece just plain. Once you ate all you could eat it’s time to store it. Put it in a paper bag and leave on the kitchen counter if you’ll finish it the same day. OR place in a paper bag and then plastic bag and place in the fridge. Since this Apple Yeast Bread contains fresh apples it shouldn’t be stored on the kitchen counter for too many days. Store it in the fridge from day 2 onward. Phew. Are you ready to make bread now? Make starter In a medium bowl mix 220ml 100F-warm water (use a thermometer!) and 7g active dry yeast and let sit for 8-10 minutes until all bubbly. Then add in 220g flour and mix with a spatula. Cover with a clean kitchen towel and let rise at room temperature for 12 hours (overnight). Prepare the bread dough Add 800g flour, another 7g yeast salt, sugar and 480ml water and 20ml milk to the starter and knead on low for at least 20 minutes until the dough is sticky and elastic. First rise Cover the bowl in which the dough was kneaded with a clean kitchen towel and let rise for 45 minutes at room temperature. Add apples Peel and core apple, cut into small pieces and fold into the bread dough little by little. Second rise Transfer dough into a parchment paper lined bowl, cover with clean kitchen towel and let rise a second time for 45 minutes at room temperature. OR (preferred! ): spread out a dish towel on the counter, sprinkle with abundant flour and corn meal and dump dough onto towel, then cover and let rise (see video for visual example). Preheat oven and dutch oven 15 minutes into the second rise preheat the oven to 450F with the dutch oven with lid inside the oven. The oven and dutch oven have to heat up at least 30 minutes. Bake the bread Take the dutch oven out of the oven carefully, lift the bread out of the bowl by holding the edges of the parchment paper up, turn around and dump into the burning hot dutch oven. OR take the turn the dish towel and dump the dough into the burning hot dutch oven. Place the lid on top and return into the oven. Bake 30 minutes with lid on and a further 10 minutes with lid off. Cool Bread Take dutch oven out of oven, remove bread from dutch oven, place on a cooling rack and let cool down completely before cutting into bread. Important note: do not ever put the bowl with starter or dough on the radiator or too close to the radiator. The dough might get too hot and the heat kills the yeast. Don't put the bowl too close to a open window in winter either. 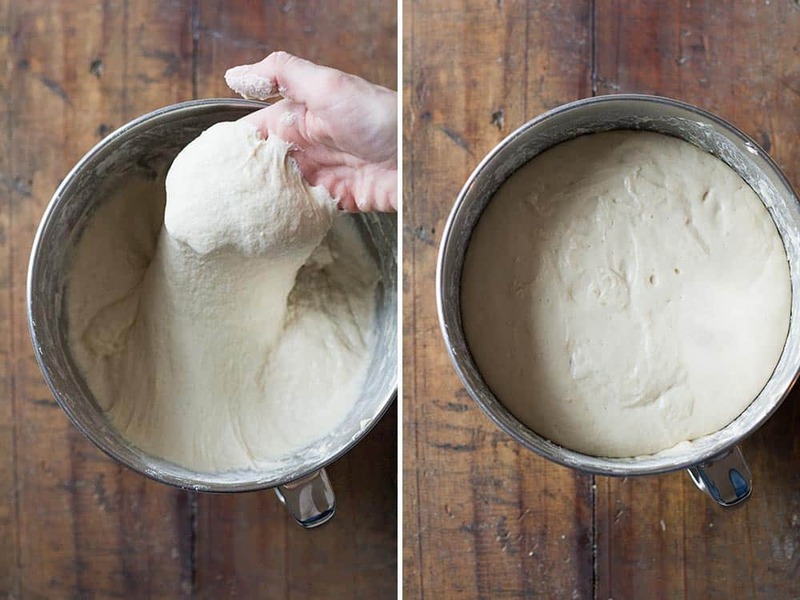 Dough that is too cold doesn't rise either. Nice recipe, in all honesty. Please, please, please hire an editor. Hi Lorena! I’m currently making this for a client. She wants more than one loaf but neither of us are certain on how it does if it’s frozen after baked. 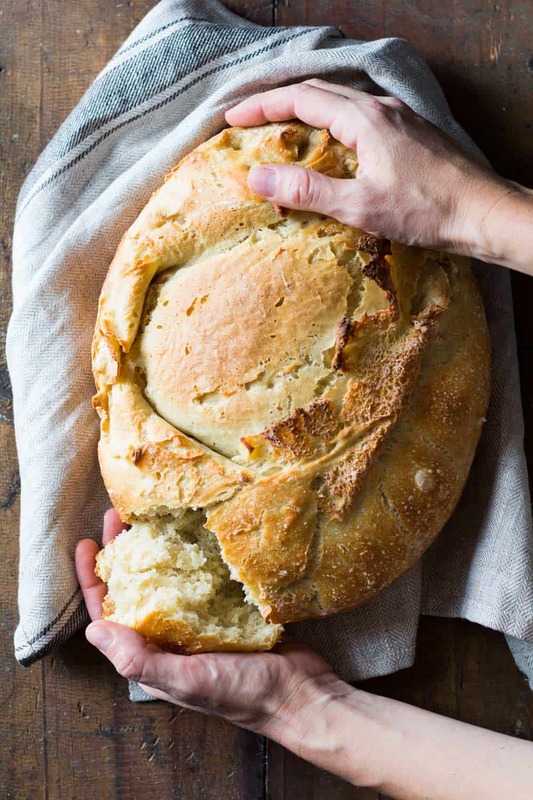 Have you ever made more than one loaf and frozen it to keep on hand? Hello Lorena, I must try your apple yeast bread! Has any one converted this to American measurement? I could use a copy. Hey Jude, this recipe cannot be converted. 1 cup of flour weighs differently for absolutely everybody because it all depends how densely you stuff the cup with flour. For bread recipes I highly discourage people to use cups. A digital scale costs no more than 10 bucks on amazon and will be useful for many many other recipes. Bread recipes have to be VERY exact so they turn out. Using cups and other volume measurements I cannot guarantee it’ll turn out. 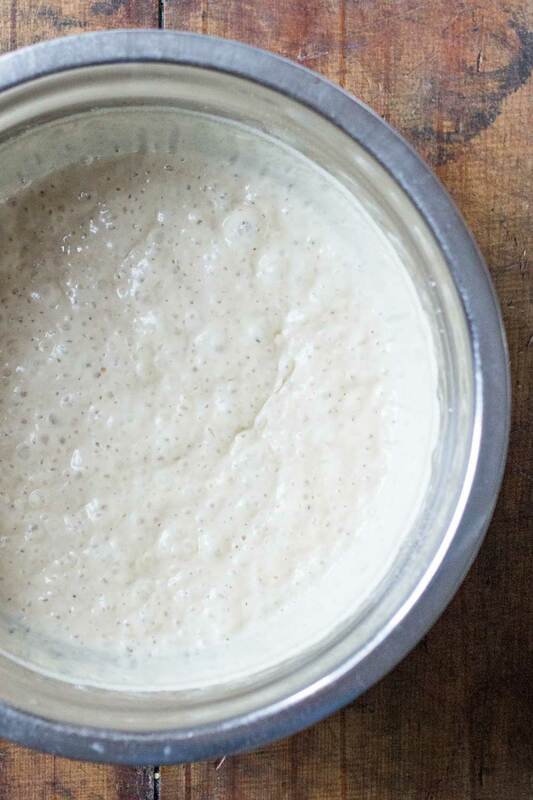 thank you, i will start it tonight…..
Hi I’m curious as I have a starter I’ve been using o all my breads, it’s awesome, three months old, what would the ratio be for using an existing starter? Cumulated weight nfor yoyr ingredients or ? Thanks eager to put this in the oven! Oh gosh, I’m sorry Mike, I have no clue but just from logic I would assume it’s 447g in total. I used 220g of flour and 220ml of water (which weighs 220g) and 7g of yeast and I don’t see why those ingredients would change in weight just because they became a starter. They basically just inflate themselves with air bubbles which don’t weigh, right? 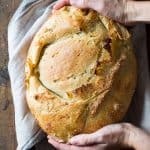 What size dutch oven does this recipe use? I have a round cast iron one, not sure of the size because it is packed up while my house is being built. I can’t wait to try this bread in my brand new kitchen. Also have you made this bread without the apples? I am looking for an artisan white bread for my husband. Also how do you store this bread from drying out while keeping it crusty? Sorry for so many questions, I used to make bread but its been years and wasn’t artisan. This recipe is perfect. I recommend anyone who can do it, because it is very good. Thank you, thank you, thank you for this recipe! I have been searching for an apple yeast bread that is not too sweet. I used to purchase apple breads in Seattle around the holidays for Christmas french toast. Now I live in Central Pennsylvania and learned to bake bread. Thank you for this recipe, it’s delicious! Hello – I’m relatively new to bread making. I’ve cut the recipe in half to cook it in a smaller dutch oven. Should I modify the baking times? Hi! The baking time is reduced but only little. I did the exact same thing (half recipe last week) and I baked for 25 minutes covered plus 5 minutes uncovered. So in total I reduced cooking time only by 10 minutes. If it’s still too white you can always leave it in another 5 minutes uncovered. The way to tell if a bread is well baked is, right out of the oven knock on the bottom and if it sounds hollow it’s done. If it doesn’t sound hollow immediately return to hot dutch oven and back into hot oven for another 5-10 minutes. Thank you so much! Just finishing the first prove right now! wheeeeee :D Don’t forget to come back and tell me how everything went please!! It was amazing! I added a bit of cinnamon and sugar to the apples and it was perfect. My family gobbled it up! My starter is all ready to go! I just measured out 25g of salt, it seems like a lot. Would I be able to cut it a bit? I had to abort the mission, the large clump of dough I ended up with was not going to turn into a beautiful loaf of bread. I think I may have to adjust the salt. Noooo, did you watch the video? The dough DOES look like a clump of sticky yucky goo. It does turn out amazing though. Did you try and bake it? Hi Cynthia, yes you can cut it but I swear it’s not a lot of salt for such a big bread. It won’t taste salty at all. Oh no :( Did you use “all-purpose UNBLEACHED white flour”? It’s important. Different flours need different amounts in recipes. Also, did you weigh the flour? Conversions to cups are not accurate. Gah! Wish I could be there and bake with you, haha. It is me again. Sorry to bug you so much, but I would really like to get into bread baking seriously. I threw away my cast iron dutch oven because it was made in China. I have been researching all brands I can find for enameled cast iron dutch ovens and so far every brand has at least some part of the process performed in China or Thailand. How would a clay baker do? Hi Brenda, no problem at all. I’m super excited that you want to start bread baking!! A brand that I really really like is Staub. It’s French/German and made in France. From what I know there are no Chinese-made parts in any of their cookware. Unfortunately, they are very expensive. They last a lifetime or even several if you properly take care of them. They can be handed down for generations, if you can afford them. I’m currently saving both for a dutch oven and a pan from Staub. I didn’t recommend them in the blog post because they are really expensive and I didn’t want people to think they can’t make my bread without one of them. The Lodge will do the job perfectly for a reasonable price tag. If you can afford a Staub, I HIGHLY recommend it. The quality is OUTSTANDING. I have been looking a lot and some of the comments from buyers of Staub from Williams Sonoma and other places complained that their article was made in China and that this was never declared online. I tried to call Staub customer service today and was sent to voice mail. Will try to check this out. I saw some Staub dutch ovens on clearance at Tuesday Morning (still expensive), but I don’t want to spend a lot of money for something that comes in any degree from China. Even Lodge is doing their enameling in China. Calling them is a good idea but I recommend either direct messaging them on Facebook or sending a tweet. Most companies with a considerable amount of social followers “work” on their social media and want to keep their social media fairy dust. Facebook and twitter like engaged pages and fast responders so pages do what’s needed ;) You’ll get a quicker response than e-mailing or calling. I’m sure. Thanks Lorena, and how do you think a clay baker would do with this bread? Any thoughts on using a clay baker with bread baking in general? Hey Brenda. It *might work but not the same way as cast iron. The thing is a cast iron pan heats up amazingly and most importantly maintains the heat even when you take it out of the oven. 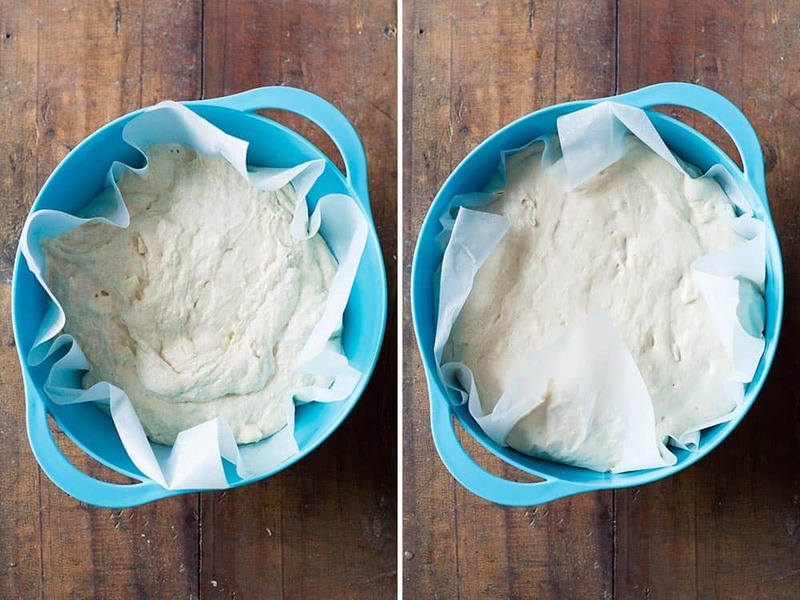 Now, will your bread turn out horrible without one? NOOOO!!! I’v made bread on a simply baking sheet. It doesn’t rise “as much” but it’s not like it won’t turn out or not rise at all. It still comes out pretty amazing! A clay baker might work wonderfully. Let me know if you try. OK, let me count the ways you have inspired and helped me. 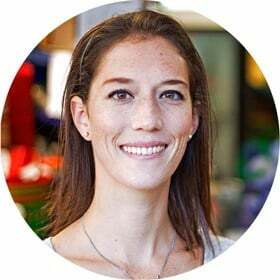 Because of you, I did a lot of research into enameled cast iron dutch ovens and Staub did reply that all parts of their dutch ovens are made in France, but that their ceramic items are made in China. Tuesday Morning had some Staub dutch ovens on sale, 40% off their discounted price! I wanted the Cocotte oval baker, similar to the KitchenAid you used, but the larger round oven with grill pan lid was also there. I debated a long time and….bought BOTH for less than I could buy one at the retail price! I LOVE them. I cooked a chicken with vegetables in the larger one in the oven and pinto beans on the stove and made your bread in the smaller, oval one. I knew my bread would not be quite like yours because I used my home ground hard white wheat (the whole grain) and not AP. The bread is very good, though different from your light, airy look. I added toasted walnuts and stirred my apples with a little coconut sugar, cardamom, cinnamon and nutmeg before adding. I love it also toasted with cream cheese and a sprinkling of cinnamon sugar on top for breakfast. What a winner! I am going to make it again with AP (even though my home ground is healthier) just to see how it turns out for me. Yours looks so wonderful. Mine is more hefty, but WONDERFUL! It was well behaved at each step of the way. What a wonderful bread. I’m doing my happy dance. Thank-you so much for this amazing journey. I have pulled out several cookbooks and now I’m off to explore the talents of my new Staub family members. You are my new best friend, Lorena! for life! Thank-you. Brenda, your beautiful comment made me cry. For real! You have no idea how happy your journey makes me. This, exactly this, is why I started my blog. To help other people discover the kitchen and delicious simple recipes made with love and dedication. I’m also happy you did all that research on dutch ovens, more reason for me to put in more effort into filling up that piggy bank for a Staub. For now I had to buy a cheap one at West Elm. Next will be a Staub for sure. Can’t wait. 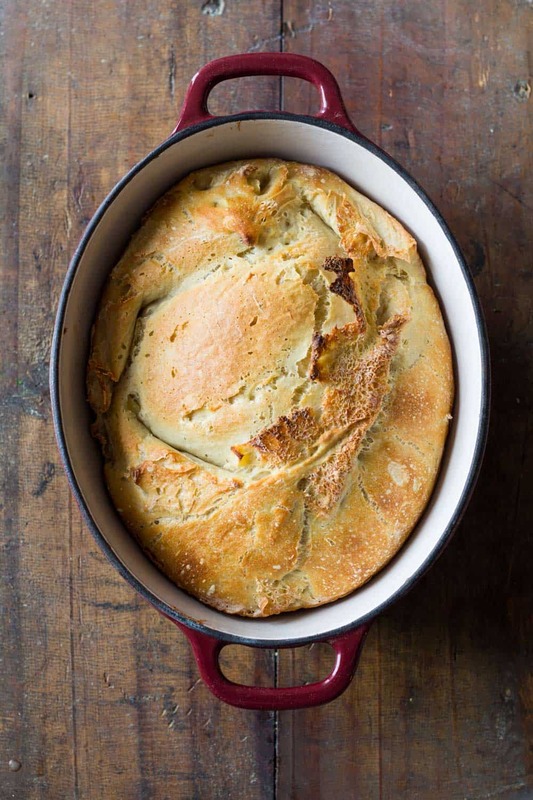 Good thing for you is, I’ll be making quite a few dutch oven recipes and breads on the blog :D Next will be another bread I’ve had in mind forEVER! This bread is gorgeous!! I want to make it. It looks like you used an oval dutch oven. Would you tell me the quart size of the dutch oven? Is it a Lodge enameled? I am currently baking this and I can’t wait for it to finish! It’s gone smoothly except for when I tried to turn the dough out into the dutch oven, it stuck to the parchment paper! I got the majority into the pan but I couldn’t get all the extra off of the paper… are you sure it is parchment paper and not wax paper? Or was I supposed to spray the parchment paper with non-stick spray before letting the dough rise a second time? Where do you add the milk salt and sugar? I don’t see them in your instructions anywhere. I’m so sorry. I completely missed that. You add it when you also add the flour and water to the starter. I just corrected the instructions. I think I’ve officially decided that this bread is more attractive than I am. And probably most people in this world. Not that I’m mad about it. Seriously, LOVE everything about this! Need to try it soon! HUH?!? My whole blog is in English. I speak hardly any French, hahaha. Why would you write a comment like that?